Become a CryptoManiaks Partner and earn a 60% commission on each sale! Create a promo code that is unique to you. Place the link along with your promo code on your website, tweets, Facebook etc. When someone enters your promo code when making a purchase, you will receive a commission. CryptoManiaks is comprised of uber-talented personnel from all over the globe featuring professional backgrounds as varied as our locations. You will earn 60% referral commission for each sale (net sale amount). Monthly payouts to your preferred method of payment. Your audience and friends will benefit from a 20$ discount on the displayed price of the course. 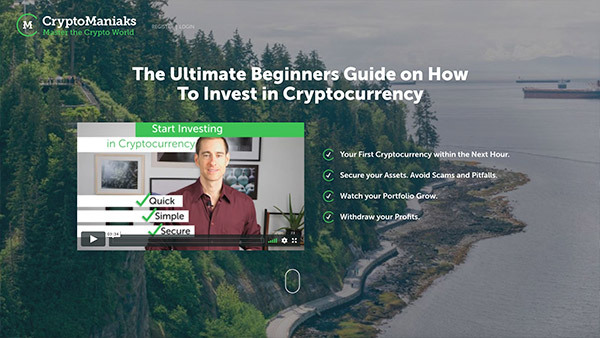 CryptoManiaks is the leading cryptocurrency education platform for beginners, and our ultimate course is considered the safest option to get started investing in Cryptocurrencies. Our team is here to help you develop your campaign to success and to provide you with the resources and answers you need to. Get 24/7 online access to your account for managing your campaigns in order to optimize traffic sources and conversions.